The Platte River provides a unique environment not just for the people who live near it, but for the species that call it home. We would like to highligh six species of the Platte, some endangered, some threatened, and some just interesting. River otters are found in all major waterways in the US and Canada and are native to Nebraska. They were hunted nearly to extinction in North America in the early 1900's because of their importance to the fur trade. 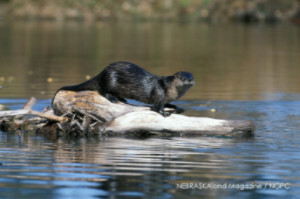 The Nebraska Game and Parks Commission worked in the 1980's to reintroduce river otters with moderate success. They selected the lower Platte River as one of their reintroduction sites because it is a biologically unique landscape. The braided lower Platte River is the perfect habitat for river otters because they require river miles, ponds, and backwater areas. The wooded banks are preferred by beavers, which in turn creates habitat for river otters. Otters use the ponds and dens created by beavers as part of their own dens. For more information, check out Nebraska Game and Parks Commission's species guide or this study conducted by a former UNL graduate student. Interior Least Terns were first seen and recorded by Lewis and Clark in 1804 and were abundant in the 1880's in the Midwest along major tributaries of the Mississippi River until they were hunted nearly to extinction. In 1918 the Migratory Bird Treaty Act stopped hunting and allowed populations to slowly grow. The regrowth population size decreased by 80% by the 1940's due to human use of their habitat. 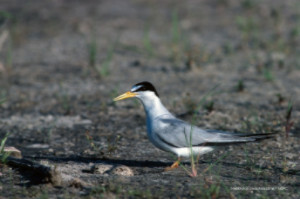 Interior least terns require sandy substrate to nest and lay eggs, making the sandbars and beaches of the lower Platte River the perfect habitat. Yearly surveys are conducted by the Nebraska Game and Parks Commission to track current population sizes. For more information, refer to Nebraska Game and Parks Commission's species guide. 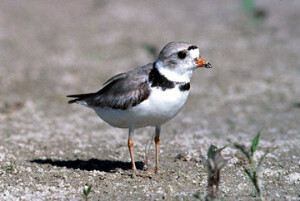 Piping plovers are almost exclusively found alongside interior least terns because of similarities in breeding habitats. While Nebraska has one of the largest breeding populations in the United States, the piping plover is considered both state and federally endangered. Plovers are migratory birds that spend the spring and summer in Nebraska and the winter in the Gulf of Mexico. There are several statewide programs focused on the conservation of piping plovers. Want to learn more? Project Beak has all the details. Blanding's Turtle has a native range from Nebraska to Nova Scotia and lives in marches, permanent ponds, small streams, and sandy substrates. It is distinguishable from other native turtles by their bright yellow chin and throat. In Nebraska, blanding's turtle is classified as at risk. There is currently a study being conducted by the U.S. Fish and Wildlife Service to determine whether blanding's turtle, among other amphibian and reptile species, should be listed as endangered or threatened. 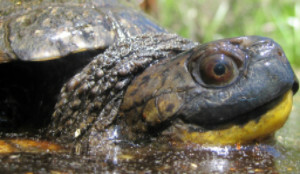 For more information, try UNL's turtle page and this website devoted to blanding's turtle. 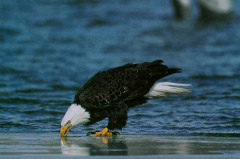 The Bald Eagle was previously listed as both a federal and state endangered species and was not seen in Nebraska. The population has since risen enough to be removed from the federal list in 2007 and the state list in 2008. The current population is monitored annually and statewide by the Nebraska Game and Parks Commission. In 2014, they observed 146 nests in Nebraska and determined 111 to be active, a record high in Nebraska. 12 of the observed nests and 7 of the active nests are found alongside the lower Platte River. Bald eagles are protected by state and federal law through the Migratory Bird Treaty Act and the Bald and Golden Eagle Protection Act. The 2014 Nebraska Game and Parks Commission Bald Eagle Nesting Report can be found here. The pallid sturgeon wasn't recognized as an individual specie until 1905. They were federally listed as an endangered species in 1990. The decline in population is largely due to habitat modification. 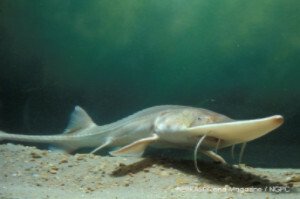 Pallid sturgeon have adapted to live at the bottom of muddy and turbid rivers like the lower Platte. While they're more often found in the Missouri River, pallid sturgeon have been known to use the lower Platte River as breeding grounds. Recent conservation efforts include the stocking of 2,000 pallid sturgeon by the Nebraska Game and Parks Commission in locations of the Missouri River that have been built to be suitable habitat. This was done as part of the Pallid Sturgeon Conservation Augmentation Program. The released sturgeon were bred at Gavins Point National Fish Hatchery from males and females that were captured in the Missouri River in spring of 2015. More information on conservation efforts can be found here, and general specie information can be found here and here.